Woodland Indians Forum / Red men's clubs?? I was looking through some old unidentified photos online this morning. I ran across one that had in the description that they were dressed for the Red Men's Club circa. 1900. I can't find anything online, anyone ever hear of these? It was an old fraternal lodge-type organization, like the Elks Club or Masons. Thanks I figured it was something like that. Guess the photo would be like the Elk's club dressed as elks. I believe that's right�though I never realized how far they took the "dressing-up" part! There was an Order of Red Men in Oxford, where I grew up. They used to rent out their hall for parties, receptions, etc. Never really knew much about them; didn't know anyone who was a member. They would dress up and march in the parades in our small town. I don't remember the women and kids being involved though, just the men. Funny, in a sad way, that I didn't see anything wrong with that when I was growing up. They looked like movie Indians, leather and feathers. I don't know if the Red Men are still around or not. Guess that's something I'm going to have to look into when I get back home. Did a little research and found . . . The Improved Order of Red Men is a fraternal organization established in the Baltimore, Maryland in 1834. Their rituals and regalia are modeled after those used by Native Americans. The order itself claims direct descent from the Sons of Liberty, noting that the Sons participated in the Boston Tea Party dressed as Native Americans. Thus, they continue to dress as Native Americans and are organized into tribes and such. Their ladies' auxiliary is the Degree of Pocahontas. They sponsor two youth organizations, the Degree of Hiawatha for boys and the Degree of Anona for girls. Another associated group is its National Haymakers' Association. The organization claimed a membership of about half a million in 1935, but has declined to less than 38,000. I know, it's Wikipedia. So decided to go a little further. Visited their official website. The Texas Red Men Foundation, Inc. maintains the Red Men Museum and Library in the same facility. It is the national museum for the Improved Order of Red Men and contains reference materials, documents, and exhibits of historical significance. The Museum and Library is open to the public without cost. You are invited to stop by and look around if you are visiting in the area. After the War of 1812 the name was changed to the Society of Red Men and in 1834 to the Improved Order of Red Men. 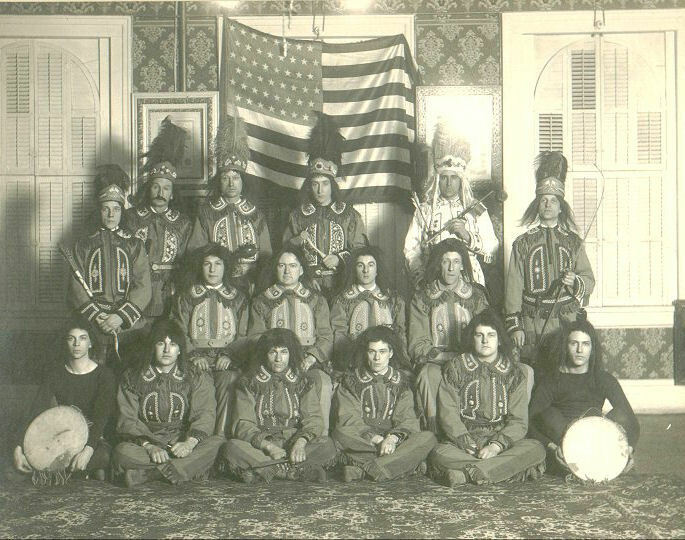 They kept the customs and terminology of Native Americans as a basic part of the fraternity. Some of the words and terms may sound strange, but they soon become a familiar part of the language for every member. The Improved Order of Red Men is similar in many ways to other major fraternal organizations in the United States. and on another site . . . The Improved Order of Red Men (IORM) traces it�s origin from the Sons of Liberty patriots who were active before the American Revolutionary War and are well known for their participation in the �Boston Tea Party.� The Sons of Liberty�and in turn the IORM�emulated in their organization, philosophy, and regalia the League of the Iroquois or �Six Nations.� �The crowning feature of the League [of the Iroquois], as a political structure, was the perfect independent individuality of the national sovereignties, in the midst of a central and embracing government, adequate to deal with all internal affairs and powerful enough to conquer all other Indian nations with which it came in contact.� Hospitality was extremely important. The Iroquois �would surrender his dinner to feed the hungry, vacate his bed to refresh the weary, and give up his apparel to clothe the naked.� Their eventual decline, however, was due primarily to the introduction of �fire-water� through the European traders. Much more about their history on this link. Like I said in my previous post, I don't know if the Red Men are still in existence back home; but if they are, I'm going to light them up. We had them down here too. Most were also members of the Klan. They stayed out of Gouldtown and Piercetown though and many had "hunting accidents" in Buckshutem WMA. One of them became Grand Dragon down here. He owned a resturant/ general store in Shiloh. He put a "lynch order" out on my dad for marrying my mom ( cause she was white). Mark Gould can tell you some real war stories about them. Wow I feel stupid, I've never heard of these people. Seriously I'm starting to wonder if I lead a sheltered life here, the original post I made I had found from the county my mom grew up in. Elsie Rout Wooddy, and her sisters-in-law, Crettie Bittle Rout and Sadie Wilson Rout when they were in the Order of Pocohontas, believed to be the woman's auxiliary of the Order of the Redman. Yes: the Improved Order of the Red Man. I have an interesting story about this peculiar fraternal organization and its offshoots. Here goes. As a child, me and my brothers knew every square foot of the hills and woods surrounding our house (we live a mile into the woods down a small, unpaved, private drive not all that far from Binghamton, NY). There was an old homestead-seeming place at the top of the hill, where a powerline eventually creeped in. There was a collapsed coral, a wind mill, a few springhouses, two buildings, and some strange stuff too. Like a massive lightening rod. I'm not kidding. One of the buildings was cracked right through the middle, and the door was gone, so we would poke in there and look at things. There was a newspaper on the floor that was dated for the exact day of the month we happened to find it, except sometime in the 40's. Eerie. Old art, broken windows, decomposing fox corpse. Real strange. Anyways, we obviously couldn't resist the temptation any more, and peeking into the grimey windows didn't sate our curiousity any, so we busted into the main building. There were tables stacked with whacky things. Inventions, contraptions, chemicals, old 8mm film projectors, just a real hobbyshop of randomness. We spent a lot of time in there, skimming over the stuff. There were a few portraits of a man named Addison Keeler, and a ton of trophies, certificates, and books bearing his name. He had a wall full of books, and I would read some of them sitting in front of a dusty window on his small, still-made cot. Books on everything from surviving nuclear fallout to hypnotism. We looked the guy up, and it turns out he was rather well-known, and was alive at the time in a nursing home, I believe. Never contacted him (but we had a ton of his stuff! and still do to this day, actually). A building in the castle-like Binghamton hospital (now a psych-ward, I believe) complex was named after him. We reasoned that maybe he had something to due with sustainability and all that. But he was an MD, a lawyer, and a bunch of other things. Turns out he was also a huge philanthropist, and that's probably why the building bears his likeness. But who knows. Anyways, that's the backstory. How it applies? Among the many thiings we found was a brass tomahawk head. We knew what a functional hatchet bit looked like, and this was not one, besides it being comprised of brass. It had a really, really small eye in it, and there was a spike off the back smaller than anything should have been to serve a purpose. On one side between said spike and 'blade' was a crude chief's head holding a pipe. On the other were the letters 'TOTE'. After some investigative work, we came across the Improved Order of the Red Man, and learned as much as we could about them, much to our chagrin. Apparently, TOTE (Totemwas something of a password for these guys, and the 'tomahawk' was supposed to be a kind of gavel that only their 'sachems' could possess. They had a really screwy structure, from what I remember (apologies, I don't have the heart to go and re-investigate on the web about them), with 'Wigwams' as meeting places. Note that the terms in quotes are really not what they imply. Anywho, if I recall correctly, they played a key role in the American Revolution, and began as The Sons of Liberty, changed into the Sons of Tammany (their spelling, but the extent to which they knew or carried on Tamamend's life, I'm unaware) and eventually into the Tammany Society, and modelled their organization after the League of the Iroquois. I could be wrong about this transformation process, but it still stands that they were very similar organizations and composed of the same people and the same mock-indian rituals. I guess they were more or less a Masonic-like group that heavily influenced politics in NYC for a while. The majority of this information came from the public library, and my brother also had a few discussions with his professor, who seemed pretty learned on the matter. Her name was something Windgate, if I recall; don't know if any of you know her. Anyways, that's my schpiel. My opinion of them is that they are, or were, a very strange sort of people. Hrm, don't know how to edit a post, so I'll just fix it here. Apparently, TOTE (Totem of The Eagle, eagle being representative of New York) was something of a password for these guys, and the 'tomahawk' was supposed to be a kind of gavel that only their 'sachems' could possess. and 'coral' was supposed to be 'corral', but I think that was obvious. Yikes! When I saw the photo of the man in white, my first thought was "looks like a klansman"! they play Bingo at the Improved Order of Redmen in baltimore maryland (in hampden). I went in there one time when i lived in baltimore. It was a mistake.